Cultivating a Politics of Dialogue in a Digital Age. In episode 8 of the Digital Dialogue, I am joined by Shannon Sullivan, Professor of Philosophy, Women’s Studies and African and African American Studies here at Penn State. Shannon is also the Head of the Department of Philosophy. She has written extensively on American pragmatism, psychoanalysis, feminist philosophy and critical race theory, including two excellent books, Living Across and Through Skins: Transactional Bodies, Pragmatism and Feminism and Revealing Whiteness: The Unconscious Habits of Racial Privilege. 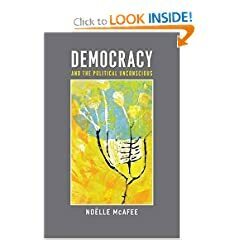 She joins me on the Digital Dialogue to discuss the recently publish book by Noëlle McAfee entitled Democracy and the Political Unconscious. The meaning of the political unconscious. The notion of a political posture McAfee introduces briefly ( p. 84). In the course of the discussion, we touch upon McAfee’s recognition that social media opens important possibilities for political community. Also in the podcast they discuss how the book helps explain what’s going on in this past week’s town hall “discussions” on health care. Check back in a day or so for a post from me on this. For the podcast, go here.